WinterBoard updated for iOS 7 and ARM64, download now! Popular iOS themeing platform WinterBoard has finally been updated for iOS 7 and ARM64 devices and it is now available for download. After this update users of iPhone 5s, iPad Air and iPad mini Retina Display will be able to download WinterBoard and install themes on their jailbroken devices. For those of you who are not aware of WinterBoard, it is a jailbreak app by Saurik that allows iOS users to apply themes and other UI elements to their devices making visual changes to them. Now it works for all iOS versions from iOS 2.0 to iOS 7.0+. Before the release of this update WinterBoard was not working on ARM64 devices at all while it caused frequent crashes on older devices. Apart from adding support for iOS 7 and ARM64 the update also brings a brand new icon and a new iOS 7-inspired look to WinterBoard. 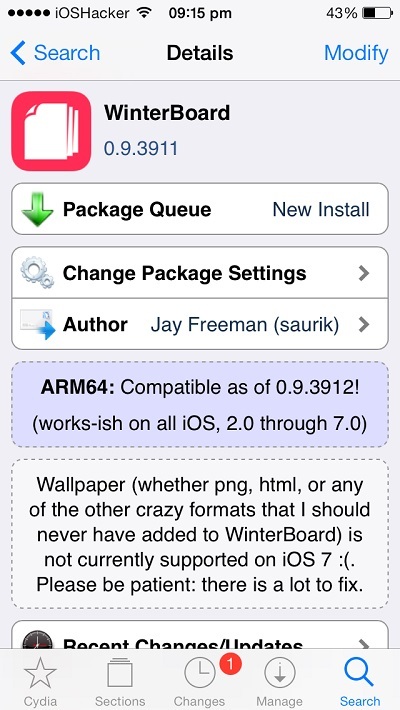 WinterBoard 0.9.3911 is available for free in Cydia right now. If you need help in figuring out how WinterBoard works then check our guide.